In medical school, when we learn about cardiovascular disease and diabetes, a key piece of the treatment protocol is "lifestyle change," which means healthier dietary choices and regular exercise. This makes sense on paper. It is a noninvasive and a relatively inexpensive form of intervention. But practically speaking it is among the most difficult prescriptions to implement. Shedding pounds is hard work. Keeping them off is harder. Furthermore, there is very little if any guidance in traditional medical education regarding how to help patients in this respect. Nutrition and exercise physiology are virtually absent from medical school curricula and have been for decades. When working with obese adolescents, physicians-in-training learn the efficacy of a step-by-step approach. Giving a litany of directives to these patients can lead to their following none of them. Suggesting a single or small number of actionable changes at each visit often yields the best results. For example: Start by cutting out full-calorie soda, follow that with exercising three times a week, then eating more fruits and vegetables, then understanding appropriate portion sizes. This series of adaptations can yield substantial weight loss. Occasionally, prescription regimens themselves create or exacerbate the problem. In psychiatry, for example, numerous common and highly effective antidepressant and antipsychotic medications lead to excessive weight gain that the prescribing physician must be prepared to address. I recall one patient with schizophrenia who ballooned 40 pounds over the course of a month. His antipsychotic medication dramatically improved his debilitating auditory hallucinations and intense paranoia but also caused him to sleep more and boosted his appetite. As we counseled this patient on portion sizes and the importance of getting out of bed daily, I doubted whether we were practicing our own advice. Exercise was generally the first thing I would relinquish when I triaged life during the toughest weeks of medical residency. In 2008, according to the CDC, 40 percent of American men were overweight and 32 percent were obese. Male physicians only marginally beat that statistic, with 37 percent overweight and 5.3 percent obese. Of American females in 2008, 28.6 percent were overweight and 35 percent were obese. That compared with female physicians at 26 percent and 6.2 percent, respectively. The unsurprising conclusion is that physicians have weight issues just like everyone else. Physicians' weight issues though may have broader consequence. Research has shown that weight impacts medical care. A 2012 study by Dr. Sara Bleich and colleagues at the Bloomberg School of Public Health at Johns Hopkins found that physicians with a normal body mass index were more likely to carry out weight loss discussions in their obese patients compared with physicians who were overweight or obese themselves (30 percent vs. 18 percent). During one memorable medical school lecture, a nationally-recognized pulmonologist stood before us and said that a physician who smokes cigarettes is committing malpractice. What about those of us who were 10, 20, 30 pounds or more overweight? Until recently, exercise has always been a chore for me. I never really enjoyed jogging. And I'd had enough spinning classes narrated by music at a decibel that would make my ears ring. I had also tried other forms of group fitness, generally classes taught by instructors who knew nothing about my goals or why I attended class in the first place. I had yet to find a gym that would hold my interest for more than a month. Exercise, I've learned, is actually a deeply personal activity, requiring a personalized solution. My salvation came late, but at last it emerged when a friend who is an actor told me about a place that is, as he put it, a combination of theater camp and marine basic training. The institution is Mark Fisher Fitness, or "MFF." Clients are "ninjas," and the majority of them are performing artists. The gym is a "clubhouse." 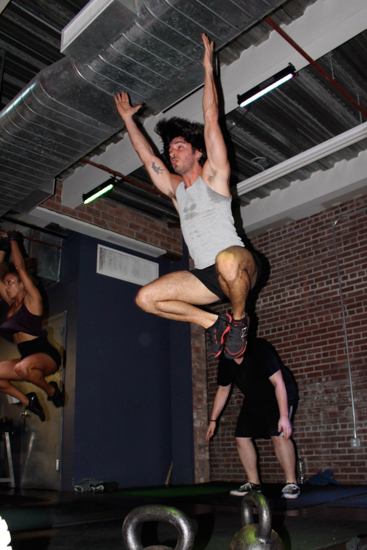 Every ninja must undergo an assessment of strength and agility before entering the clubhouse to ensure a safe workout. Technique is paramount. The motivational approach, significantly more difficult than it sounds, is "one percent better each day." Instructors meet weekly to discuss each member so, in keeping with the community ethic made famous by Cheers, everybody knows your name. Plus your life story. Mark Fisher demonstrates a burpee with fellow ninjas. The approach at MFF is holistic. The importance of rest, hydration and nutrition are integrated into cross training classes and reinforced in informative monthly newsletters. Such "knowledge bombs," as they're called, include a healthy sleep target of seven to nine hours nightly and consuming 96 ounces of water daily. Ninjas learn about making healthier dietary choices, guided by the mantra, "food that your grandparents would recognize." There is also a focus on the percentage of protein that should be in your diet to lose fat and gain muscle, and low calorie substitutes to foods like peanut butter (check out PB2). Fitness classes involve interval training with resistance bands and kettlebells. There is a cycle of classes that increase in intensity every week and changes every month. Life at MFF is effusive and energetic, rich with high fives and profane language. Mark Fisher himself is a former actor-singer-dancer who found his calling as a fitness instructor by training fellow actors with whom he toured. The rest of the instructor cast includes belting divas, professional drag performers, a pediatric clown from Memorial Sloan Kettering Cancer Center, an Emmy winner, and people who generally love Elaine Stritch. One trainer, Brian Patrick Murphy graduated from Ole Miss as a self-described frat boy with a big heart, prances around class in a pink speedo bikini bottom "just like any other straight dude." 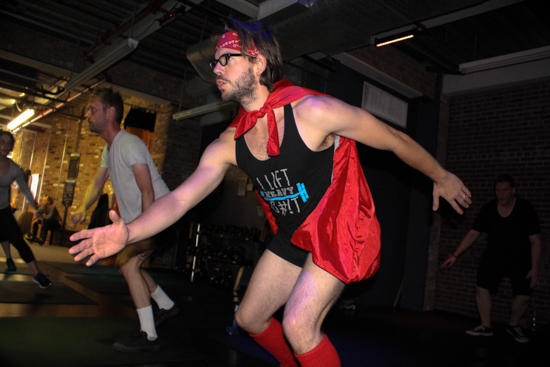 Another instructor/entertainer, Matt Wilson, recently led a class dedicated to the Rocky Horror Picture Show wherein he began the workout in a suit, ripping it off mid-way through class to reveal fishnet stockings and heels, which he proceeded to exercise in for the remaining 30 minutes. The classes are as psychically motivating as they are entertaining, each session ending with a moment of meditation. Matt Wilson teaches a class. One of my fellow ninjas, Katie Finneran, who is a two-time Tony winner and cast member of the Michael J. Fox Show, used to spend hours each week lifting weights and running. She was constantly exhausted and not pleased with her training results. Amid the constraints imposed by work and motherhood, efficiency is the sacred antidote to the scarcity of time. She notes feeling more energized by strenuous workouts at MFF that last just one hour. In her words: "Training at MFF nourishes my entire life with the added perk of a completely transformed body." For me and Katie, laughing our way through an intense workout surrounded by interesting and passionate people has been life changing. For the first time, I enjoy exercise. At my most recent annual physical, my primary care doctor told me that I am the healthiest I've been in a decade. Additionally, the lessons I have learned at MFF have informed my work with patients, including how to think holistically about nutrition and fitness, how to individualize a regimen, and how to design one that is executable. Working out with an instructor in a pink speedo is not for everyone. Others will thrive on morning jogs or spinning or dance classes or a Y membership. The important thing, for physicians as much as everyone else but arguably in particular for physicians in our role as healthcare guardians, is finding the mode of exercise that can be a way of life. 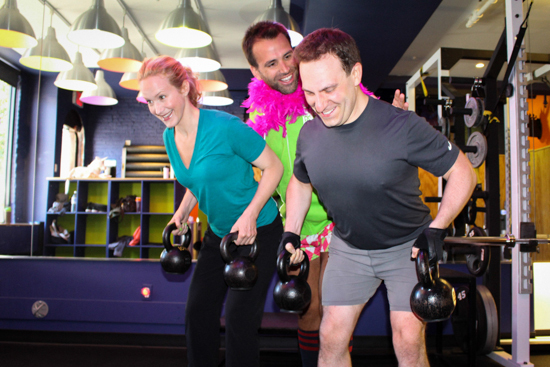 Katie Finneran and I laughing our way through a workout with our trainer, Brian Patrick Murphy. All photographs by Blair Jarvis.